Larycia Hawkins speaks in Alice Millar Chapel. The former Wheaton College professor discussed religious solidarity drawing her on departure from the evangelical Protestant college. 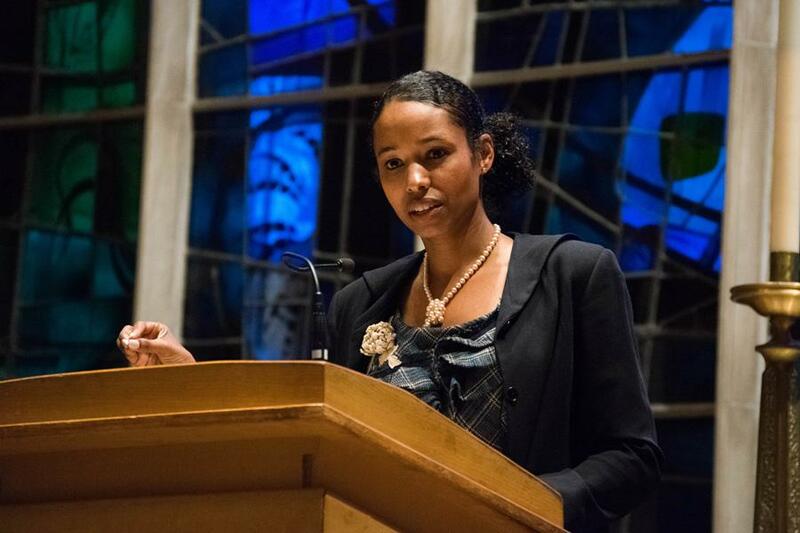 Larycia Hawkins, a former professor at Wheaton College, spoke at Alice Millar Chapel on Thursday evening to share her perspective on embodied solidarity. was that Muslims and Christians worship the same god. This “potentially violated” the school’s statement of faith, she said. The speaker event was part of an annual speaker series co-hosted by the Public Affairs Residential College and the University Christian Ministry, said SESP sophomore Sumaia Masoom, outgoing PARC secretary. The talk was attended by about 50 people and focused on making the transition from theoretical to embodied solidarity, as well as defining the concept of embodied solidarity. Hawkins highlighted her belief that in order to understand embodied solidarity, people have to position themselves among the vulnerable. She said there is no such thing as invisible oppression, but whether or not one sees the oppression. In December 2015, Hawkins donned a headscarf worn by Muslim women in an act of religious solidarity, for which she said she was placed on leave for “potentially violating Wheaton’s statement of faith.” Three months later, Hawkins officially left Wheaton and was later offered a position at the Institute for Advanced Studies in Culture at the University of Virginia. “Since Jesus’ incarnational descent to humanity is what Christians celebrate during the days before Christmas, I felt inspired by that divine history to make my solidarity with my Muslim sisters embodied in a profound, historical moment,” Hawkins said. Hawkins began her speech with a list referencing what she said were examples of oppression in the world such as Ferguson, Missouri; Flint, Michigan and the Gaza Strip. Hawkins said the problem in both society and politics is best described as a “body problem.” She defined this as the way bodies of marginalized groups — particularly black and Muslim bodies — are “dehumanized and zombified,” depicted as lesser than humans through degrading social stereotypes and political rhetoric. Masoom said recent Islamophobic and xenophobic campaign rhetoric in national news made this a crucial time for an event focused on these ideas. “We didn’t know that the graffiti (at Alice Millar) was going to happen, but the fact that we had this building reserved for this ahead of time just really hits home Hawkins’ message about embodied solidarity,” Masoom said. Julie Windsor Mitchell, campus minister at the University Christian Ministry, helped plan the event and said she was moved by Hawkins’ moral courage to wear the hijab in solidarity with Muslim women. Mitchell said Hawkins’ message was important to her because, as a Christian, she feels responsible for speaking out against hate and injustice in all forms and that translates into action. Hawkins also talked about her experiences visiting Rwanda and South Africa last summer and said it gave her time to think about some of the greatest indignities in history — apartheid and genocide — and what it means to be in solidarity with the suffering when one does not know what suffering truly looks like. During the Q&A portion of the event, one student asked if Hawkins was concerned about culturally appropriating Islam when she wore the hijab. Hawkins said she had been worried and spoke to connections she had at the Council on American-Islamic Relations on the matter extensively, but wished to make clear that it was an act of solidarity rather than a political move. This story and headline was updated Monday to clarify Hawkins was placed on leave because her explanation behind wearing a hijab potentially violated Wheaton’s Statement of Faith.